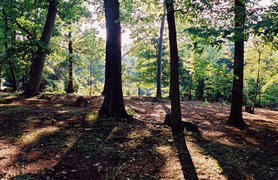 In 2001, Monticello's archaeologists positively identified the site of a burial ground for Monticello's slaves in a flat tract of wooded land about 2,000 feet below the main house. Jefferson never described or mapped where his slaves were typically buried, but the site had long been suspected as a possible cemetery because of oral tradition as well as the visible presence of rows of linear depressions corresponding to individual burials. Monticello's archaeologists found 20 graves by excavating only deep enough to identify the tops of the grave shafts. None of the graves were excavated more than a few inches.